You’ve heard this advice over and over. It originated with the book The E Myth: Why Most Businesses Don’t Work and What to Do About It, by Michael Gerber. Seems like smart advice. But it can be hard to execute, especially when you have a demanding client-based business. It’s been awhile since I worked with clients, but believe me — I’ve been there. There is, however, a way to make sure you’re continually working on your business even as the “in” remains hectic. And this process can do more than lead to incremental improvement … it can completely transform the business you have. The key is taking small steps aimed at constant improvement. Otherwise, your business ends up in homeostasis — or the familiar comfort of remaining “in” the business — until one day things have changed for the worse. Simple enough. But sometimes the big idea of constant small steps leaves you wondering where to begin in the first place. So, in this episode, let’s explore a framework for figuring out what to improve that lends itself to a constant cycle of improvement that leads to big change through small steps. 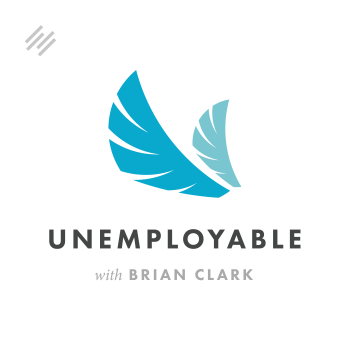 Brian Clark: This episode of Unemployable is brought to you by Productize, the training course that teaches freelancers, consultants and other professional service providers how to escape selling their time for money. Discover a step-by-step methodology for creating a value-added, systematized, done for you offer, packaged neatly as a product with a defined scope and price, so you can break free from billable hours. Visit Unemployable.com/Productize to find out more. Brian Clark: Work on your business, not in it. We’ve heard this advice over and over. It originated back with the book The E-Myth: Why Most Small Businesses Don’t Work and What to Do About It by Michael Gerber. It seems like smart advice but it can be hard to execute on, especially when you have a demanding client-based business. It’s been a while since I worked with clients but believe me; I’ve been there. There is however a way to make sure you’re continually working on your business even as the ‘in’ remains hectic. And this process can do more than lead to incremental improvement, it can completely transform the business you have without killing yourself in the process. The key is taking small steps aimed at constant improvement. Otherwise, your business ends up in homeostasis or a familiar comfort of remaining in the work until one day, things have changed for the worst. Welcome to Unemployable. I’m your host, Brian Clark. Thanks for tuning in. The Japanese word kaizen simply means change for the better. It could be a onetime change or a continuous process for change. In the modern business context however, kaizen has come to mean continual change for the better or constant improvement by implementing small steps to achieve a larger goal. Over time, those small steps lead to big change, even transformation for the better. It applies to workflows, processes and procedures and even new product and service development. Simple enough, but sometimes the big idea of constant small steps leaves you wondering where to begin in the first place, so in this episode, let’s explore a framework of figuring out what to improve that lends itself to a constant cycle of kaizen that leads to big change through small steps. The term entrepreneurship refers to how and why some individuals identify opportunities or gaps in the market, evaluate them as viable and then decide to exploit them, whereas others simply do not. Not every small business owner is an entrepreneur but you will be if you follow this process, even if you think of yourself as a freelancer or consultant. Let’s take a look at the four steps. This particular process is called the OODA loop. That’s O-O-D-A as featured in the book The Creator’s Code: The Six Essential Skills of Extraordinary Entrepreneurs. I’ve been following a similar process for over a decade with our companies, but we don’t call it that. As an aside, it’s smart to understand that kaizen influenced lean manufacturing in Japan and eventually the rest of the world, which in turn influenced agile software development and eventually, the lean startup movement. I got started with these philosophies before the lean startup thing happened due to my business partner Tony Clark, who recognized that I was naturally applying agile development principles to content creation in the early days of Copyblogger. Point being you cannot really go wrong with this process, which involves observing, orienting, deciding and acting. First, you observe. Look at what’s happening with your business. How are people actually using your product or experiencing your service? Where’s the potential gap? Next, you orient. Analyze the information you have and come up with various ideas about how you can improve. Then you decide. You form a hypothesis about how to improve and you map out the small steps that will lead to improvement over time. Finally, you act, working methodically to implement the smaller steps that achieve the overall goal, but you’re not done. Now that you’ve acted and arrived at the change, you go right back to observing how people are now using the product or service and proceed through the loop again. Let’s look at an example that everyone knows, YouTube. Did you know that the popular video platform was initially a dating site that let users rate the photos and videos of others? Then the founders observed that people were interested in uploading all sorts of videos, not just things that were related to dating. At that point, the young company oriented their thinking in ways that can improve the platform. Then they decided to go all in as a video platform for any type of content. YouTube then acted to make embeddable video player code available, first in MySpace users, then to anyone with a website. Take note, YouTube did nothing more than reorient their existing assets in a new way based on observable phenomena. Without creating new tech, YouTube pivoted and right out led Google to acquire their company for $1.65 billion. Here’s another example of using existing assets to create a new product, this time for my own company Rainmaker Digital. We observed, thanks to customer feedback, a gap in the market between our WordPress hosting and design business lines and our upmarket Rainmaker marketing automation solution. We then oriented ourselves toward imagining how to fill the gap between an all in one website builder like Squarespace for example, while still retaining the power and flexibility of WordPress. The decision was made to leverage our hosting technology on the WordPress side and the assets on the Rainmaker side into a new kind of website solution under our StudioPress brand. In 2016, we acted on the plan assembling existing tech components into a new solution built from the ground up, and this launches in just a few short weeks. Of course, then we’ll observe the market reaction. I’ll make sure to loop you in on that. Let’s look at one more application of the process that’s relevant to all of you out there who are currently providing services to clients. You can apply the OODA process to your existing business to discover and implement a productized service. A productized service is a value-added systematized done for you offer packaged neatly as a product with a defined scope and price so you can break free from billable hours. This packaging allows you to systematize and scale your business like a product company while eliminating a lot of the hassle that comes with working with clients under our unique scope of service every time. For example, plenty of developers in the WordPress space do small projects to help fix problems that invariably pop up for site owners. It’s high paying and high hassle work when it comes down to it. Enter WP Curve, a monthly subscription service that allows you to submit an unlimited amount of small tasks that are handled by WordPress developers from around the globe. Their recurring monthly revenue model turns a marginal freelance business into a scalable asset. Here’s something that never happens with a marginal freelance business. WP Curve was recently acquired by GoDaddy, leaving founder Dan Norris free to pursue his next adventure. How do you transform your service business into a productized service business? Let’s try the OODA process. You could observe for example that a decent amount of your client work is routine and could be fulfilled by people other than yourself. You then orient your thinking to establish a process that allows you to provide this one service as a package deliverable with a tightly defined scope and set pricing. Once you figure it out, you decide to make the switch, possibly even through a new separately branded website. You act by launching the productized service. Then of course, you’ll observe the reception and tweak as necessary by going through the process again, but guess what, you just totally transformed your business by taking baby steps. Another one of our company optimization projects last year was sparked by the observation that people need things done for them related to the Rainmaker Platform, like setup, design and content. More and more, it’s becoming that what’s needed is software risk service instead of just software as a service. We’re certainly not interested in becoming a full-service agency so productized services are what we’re working on and since we haven’t historically offered services like many of you do, I went into research mode to see if there was anything missing, which brings us back to today’s sponsor, the Productized training course. I came across the course over the holidays while doing my research and decided to buy it. Yes, I paid for it like I do with countless other courses each year to make sure my own expertise remains up to par. I was impressed. We were able to glean plenty of useful tips and tactics that we would otherwise just have to learn the hard way. That said, Productized is perfectly geared towards freelancers and other professional service providers who are currently serving clients. Even though I found the course to be excellent and useful myself, it’s really designed as a step-by-step guide for those who are currently doing client work and want to transition to a productized service. That applies to many of you out there. Make no mistake, applying the OODA process to your existing business can definitely get you there, but if you’re looking for specific steps for shifting to a productized solution, this course is dead on, plus there’s a community of fellow learners you can lean on for help and even a coaching option if you get stuck. Visit Unemployable.com/Productize to find out more. That’s Unemployable.com/Productize. Here’s to business transformation in 2017 for all of us. As always, thanks for listening and keep going.